Micro-Needling: All You Need to Know! Micro-needling (also known as collagen induction therapy) is a minimally invasive treatment to rejuvenate the skin. A device with fine needles creates tiny punctures in the top layer of the skin, which triggers the body to create new tissue layers of elastin, collagen fibers and increased blood circulation. Results can include improved texture and firmness, as well as a reduction in acne scars, traumatic scars, pore size, stretch marks, hyper-pigmentation and hypo-pigmentation. This can be enhanced with the application of stem cells and hyaluronic acid serums. Ready to learn more? Read on as we address some commonly asked questions surrounding the micro-needling process. The micro-needling pen device glides gently along the skin, penetrating the layers of the skin closest to the surface, of a depth of .5mm up to 2mm to create numerous tiny needle wounds. The therapy encourages the body to respond through creation new collagen and elastin fibers. As the skin responds, it plumps and thickens, reducing the appearance of scars, wrinkles and fine lines. The skin is cleaned and numbing cream applied to lessen discomfort. For better results during the procedure, we use Just Jill Natural skincare product called Anti-Inflammatory Serum, a collagen-stimulating product with Hyaluronic Acid. A small hand held pen like device with a sterile, disposable tip with 12 tiny needles is then used to pierce the skin. Our needling pen’s multi-speed and adjustable needle depth allow needles to pierce the skin’s layer at 90 degrees and increase the absorption of products. After the treatment, cold towels and Anti Inflammatory Serum a soothing Hyaluronic acid is used to hydrate, heal and protect the skin. Most people will experience mild redness and possibly some swelling. The same way you may feel with a mild sunburn. Effects may last for 24-48 hours and there may be pinpoint bleeding and/or bruising. Within several days to several weeks you will notice a smoother, brighter, and more radiant appearance, however, the full effects of the treatment do not appear until several months later. What is the down time like? The inflammatory reaction of the skin is extremely short and fades significantly within hours from redness to pinkish that may last for 12 to 48 hours. In order to reduce visible redness, we recommend Anti-Inflammatory Serum, a hyaluronic acid after the procedure, and to protect the skin with Sun Shield, a zinc based sunblock. We do not recommend makeup or sweating (exercise) for 6-12 hours after procedure. Cold towel every hour after the procedure will help speed up the healing process. Your therapist will give you a detailed post instruction sheet. Numbing cream can be applied prior to the treatment which drastically minimizes or eliminates any pain altogether. The tiny pricking channels close within one hour, and because the procedure is performed under clinical conditions, the likelihood of infection occurring is extremely low. Micro-needling can be safely repeated every 4-6 weeks until you achieve the desired results. For collagen induction we recommend to start with 3 treatments, but with a minimum separation time of 4 weeks between treatments. For scar reduction an average of 6 treatments are recommended. The number of treatments required will depend on how each individual responds to the treatments, and the extent of the damage. For maximum results alternate a peel in-between each Micro-needling treatment. For example: Micro-needling, in 3 weeks a peel, in 4 weeks Micro-needling, in 3 weeks a peel, etc. Micro-needling can be used on all skin parts of the body (neck, décolleté, arms, legs, etc). Most people will begin to see results 30 days after the very first appointment. Can micro-needling be performed for all skin types and colors? Absolutely. It’s safe and effective for all types and colors of skin. There is no risk of post-inflammatory hyper-pigmentation. There are virtually no negative side effects from the procedure. None of been reported in over 150,000 procedures performed worldwide. How Is A Micro-needling Pen Different From Dermal Needling Rollers? Automated micro-needling devices move in a vertical direction for better precision when treating the skin. Unlike Automated Micro-needling the roller does not create a precise vertical action. The lack of precision can contribute to greater discomfort and inconsistent effects to the skin. How Is A Micro-needling Different From Lasers? 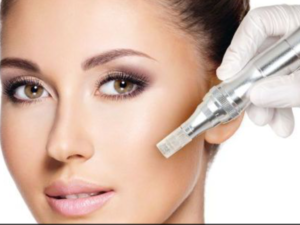 Unlike lasers, Micro-needling breaks up pigment mechanically and stimulates the collagen formation without heat. Removing heat from the equation makes for a safer, more comfortable treatment with a very low complication rate. No heat also equals less downtime! Most Micro-needling patients are red for 12-24 hours or less. That advantage means you can get the procedure performed on a Friday and be back to normal for work on Monday. A sterile cartridge containing 12 tiny micro-points is attached to the Micro-needling instrument. Your skincare professional will apply a thin layer of Anti-Inflammatory serum which contains Hylauronic acid to your skin and select the appropriate treatment setting based on your unique needs. Next, in a single motion, the pen will be gently pressed against the skin while simultaneously gliding until the entire treatment area has been covered. This process results in thousands of superficial microscopic channels throughout the entire treatment area. How do I care for my skin after a micro-needling treatment? Immediately after your Micro-Needling procedure, do not take any anti-inflammatory medications such as ibuprofen, Motrin or Advil. These agents will interfere with the natural inflammatory process that is critical and responsible for your skin rejuvenation. Day of procedure: After your procedure I may apply anti-inflammatory serum and growth factor booster. It is highly recommended you purchase the post treatment kit ($20) and follow the instructions for the next 7 days. Day 1: On the next day, you may clean your face as usual and apply makeup, lotions and other topical products as usual. Stay away from exfoliants or glycolic acids, vitamin A, retinol that are present is your skin care routine as these can make your skin very dry after the procedure. Be sure to use an approved sun screen. AVOID THE SUN !! Days 2-7: Within two (2) days following your Micro-Needling procedure, you may notice skin dryness, flaking and maybe some eventual micro bruising. This is due to an increased turnover of skin cells. During this period, you may apply your regular skin moisturizer. Follow the post treatment instructions given to you by your esthetician. Your skin may start shedding. These are skin layers that would regularly shed a week later, but the Micro-Needling brings this skin to the surface sooner. During this temporary process, your skin will shed and be dry. Days 7+: A week after the Micro-Needling procedure, most clients notice that their skin is smoother and more radiant. Ready to get started? Fill out the consent form and book your micro-needling appointment today!